Consulting firm McKinsey has played a key role in pushing a version of REDD that underestimates the role of industrial logging and agriculture on forest destruction, while painting local communities as forest destroyers. McKinsey’s advice, if taken seriously, would have had serious implications for local livelihoods and would do little to reduce deforestation. In November 2010, Rainforest Foundation released a report criticising McKinsey’s REDD advice. This was followed by a Greenpeace report in April 2011. Meanwhile, the blog PNGexposed has done a great job in documenting McKinsey’s activities in Papua New Guinea. McKinsey was paid US$2.2 million to produce a draft “National REDD and Climate Change Plan” in the run up to the UN climate meeting in Copenhagen in 2009. This was followed by another US$500,000 in September 2010 for 10 weeks work. McKinsey’s report cost the PNG government more than US$11,000 a page. This work involved “very little actual time on the ground in PNG”, according to informed leaked from McKinsey and posted on the PNGexposed blog. Among the reasons the source gave for McKinsey’s dismissal were the new government in PNG and the NGO campaign, “although we joke that the real reason is that we can no longer afford their bills!” he added. 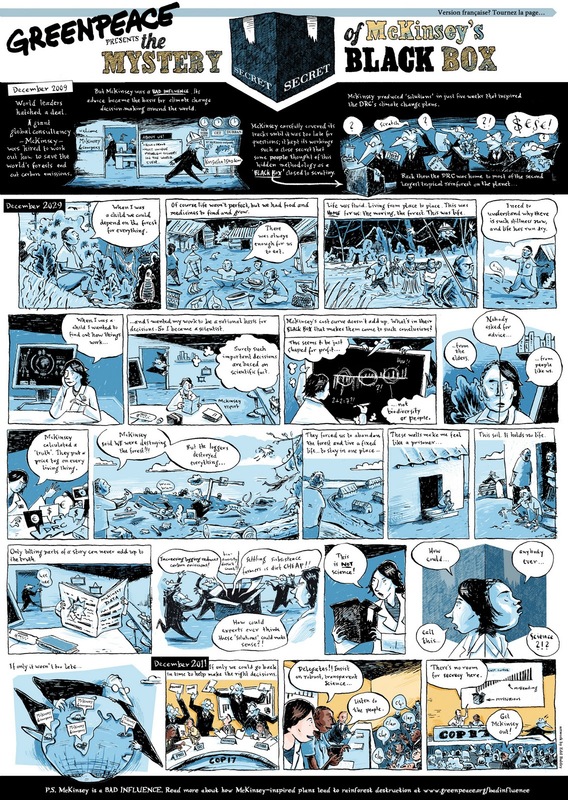 For the Durban climate meeting, Greenpeace asked illustrator Edd Baldry to produce a one-page comic about what would happen if the Democratic Republic of Congo took McKinsey’s advice (click on the image for full-size). The comic is also available as a slideshow and a French version is available here (pdf file, 17.2 MB). Greenpeace activists distributed the comic at a side-event in Durban where a McKinsey representative was speaking but were (politely) asked to leave. One of the most serious problems with McKinsey’s analysis is that it is not transparent. What happens between the data entering McKinsey’s office and coming out as McKinsey’s “cost-curves” is a mystery to anyone outside McKinsey. McKinsey’s working method is a black box. McKinsey argues that how it works is subject to commercial confidentiality. But even Benoît Bosquet, the coordinator of the Forest Carbon Partnership Facility at the World Bank, has noted that “the blackbox is a problem for everybody”. McKinsey has consultancy divisions for mining, pulp and paper and forest products. This is a potential conflict of interest, since these industries are important drivers of deforestation. But when journalist Johan Hari asked McKinsey about conflict of interest, they declined to reply. In the UK, McKinsey was providing advice to the government on NHS reforms and to companies that hoped to profit from the reforms. A series of companies that hired McKinsey have subsequently gone bust. Enron was paying McKinsey US$10 million a year, before its famous meltdown. BusinessWeek points out that Swiss-air, Kmart and Global Crossing are also on the list of McKinsey clients that have gone bankrupt. McKinsey was central in the AOL-Time Warner merger which Jeff Bewkes, the chairman and chief executive of Time Warner, described as “the biggest mistake in corporate history”. As Greenpeace’s David Ritter notes, the most damaging revelation to hit McKinsey last year was the insider trading scandal involving Rajat Gupta, who was head of McKinsey from 1994 to 2003 and remained a senior partner until 2007, and another ex-McKinsey partner, Anil Kumar. McKinsey’s global managing director, Dominic Barton, acknowledged that the case is “incredibly distressing and embarrassing” for McKinsey. But there is a structural problem involved with McKinsey’s advice on REDD. McKinsey is a consulting firm and as Smith notes, “consulting is project based”. The company is interested in winning future contracts from its clients. McKinsey is frequently hired by governments, pulp and paper companies, logging companies and mining companies. On the other hand, McKinsey is far less likely to be hired forest dwelling indigenous communities. While opening up McKinsey’s black box would not address these conflicts of interest it might at least make them more transparent. Made up data, unobtainable information, flashy report – sound familiar to anyone who’ve read McKinsey’s REDD reports?! Mckinsey’s exit is a relief for PNG. Atleast national experts can expose their skills and wisdom not only for the money, but, for the issue and the people of the country. National experts have been suppressed, intimidated and pushed around and micromanaged , because McKinsey consultants enjoyed so much privilleges. All McKinsey consultants were bosses at OCCD, the office responsible Climate Change in PNG.